​Medical Microneedling is a revolutionary procedure that stimulates your skin’s natural ability to produce new collagen and elastin for healthier, younger looking skin. This procedure creates microscopic channels into the epidermis and dermis leading to cellular rejuvenation, tissue tightening, and smoothing of skin imperfections. What conditions can be treated with the SkinPen? 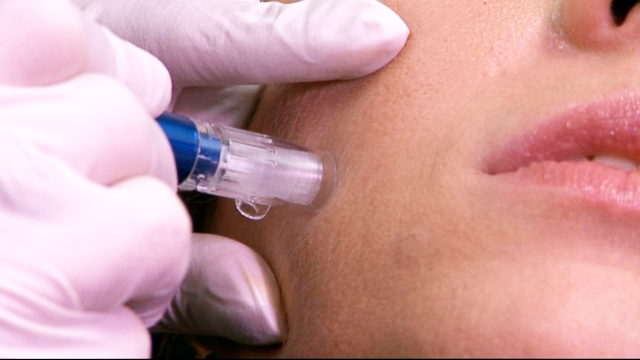 SkinPen is a medical grade, state-of-the-art microneedling device that allows for treatment to deeper parts of the skin without removing or damaging the top layers of the skin. It creates precise and purposed micro injuries within the epidermis and dermis to trigger your skin’s natural ability to produce new collagen & elastin for healthier, younger looking skin. You can expect a relaxing experience in a private room. The procedure will last less than an hour and can easily be accommodated during a lunch break. How many treatments are needed and when can results be seen? The average is 3-5 treatments depending on individual needs. Treatments are spaced every 4 weeks. Most individuals will notice healthier-looking skin immediately. Dermal collagen remodeling takes place over time, and will continue to improve for up to 6 months after your final treatment.